THIS HOME, staged by Butch and Sheila Reynolds of Presentations Home Staging, was a “spec” home for an area builder that was staged with inventory from Presentations Home Staging. Presentations Home Staging offers a full line of rental furnishings, including furniture, art, plants, accessories, linens and area rugs. BUTCH AND SHEILA REYNOLDS, owners and operators of Presentations Home Staging, use a variety of techniques to create focal points in each room of a home that draw a buyer’s eye to the room’s features. In this home, the Reynolds augmented the homeowners’ furnishings with some of their furnishings. THIS STAGED HOME is another example of Butch and Sheila Reynolds work, who augmented the homeowners’ furnishings with some of their own. Numerous items may be rearranged, moved completely or added when staging a home in order to improve the flow of the home. As the winter months continue to creep by in the Pacific Northwest, people trying to sell their homes may be feeling discouraged that the winter season just isn’t the perfect time to sell a home. According to Butch and Sheila Reynolds, owners and operators of Presentations Home Staging, however, that is simply not the case. Butch and Sheila started Presentations Home Staging in the spring of 2006 and the company is based in Battle Ground, although they will go wherever their client needs them to help stage a home. The Reynolds have worked to stage homes as far away as Whidbey Island, WA, and Depoe Bay, OR. As Accredited Staging Professionals (ASP), they are trained to follow a process that de-clutters the home, improves the flow and increases the buyer’s appreciation of the home’s features. Some of the ways that the professionals at Presentations Home Staging stage homes in order to help them sell faster include reducing the personal photos and creating focal points in each room that draw the buyer’s eye to the room’s features. The Reynolds said they also try to improve the flow, allowing buyers to tour the home in a more spacious environment, which they said is important, even if the seller has a 5,000-square-foot home. Recently, Butch and Sheila said the results they’ve experienced after their home staging work reflects a significant increase in the number of homes they’ve staged and the rapid response those properties have gotten from the buying public. The two said homes being staged in the Portland Metro area are showing better results than those in Clark County, but all of the numbers are certainly on the rise. In November/December, Butch and Sheila had five of their staged homes sell, two of those in less than four days. The Reynolds said they believe there’s a certain level of stability that has been achieved recently in the real estate market and employment in the area. Combined with members of the federal government promising to keep the rates low for the next five years and the “exceptional” values that were created with the market drop, Butch and Sheila said these conditions have allowed buyers to be more willing to make a move. “Once the lenders relax and improve their lending criteria for eligible buyers, the market will certainly improve even faster,” they said. Some homes that need to be staged can be a challenge, even for professionals like Butch and Sheila. One of the larger projects they did consisted of adding gravel to the existing driveway at a home in Ridgefield and creating another point of entry that forced the touring buyers and real estate agent to enter through the front door rather than the back door, which had been more convenient prior to the change. When buyers had to enter through the front door, they were able to see the great courtyard and outbuilding near the courtyard that they weren’t seeing when entering through the back door. The Reynolds said this home was on the market for more than a year and they staged it and sold it in less than 30 days. Staging homes has been placed at the top of the home preparation list by the National Association of Realtors (NAR), Money magazine, Fox News and several web-based real estate marketing giants such as Trulia, Zillow and others. 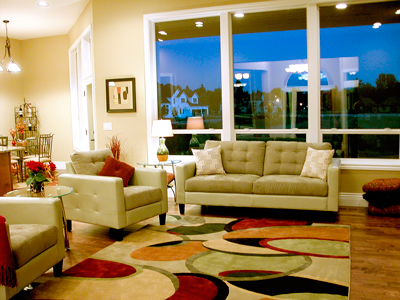 Currently, Presentations Home Staging offers staging consultations for $145 and they last for two hours. Butch and Sheila said their staging fees vary, depending on how much they need to do, whether the home is empty or not and the accessibility of the property. They said they’ve staged homes for as little as $350 up to more than $2,000. They also provide a full line of rental furnishings, including furniture, art, plants, accessories, linens and area rugs. The rentals are month-to-month, with no long-term contracts. 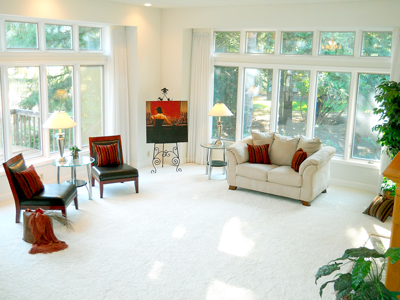 For more information on Presentations Home Staging and services offered, contact Butch and Sheila at (360) 666-9461 or visit their website at www.StageUsNow.com.